Beer and Johnston's Mechanics of Materials is the uncontested leader for the teaching of solid mechanics. Used by thousands of students around the globe since publication, Mechanics of Materials, provides a precise presentation of the subject illustrated with numerous engineering examples that students both understand and relate to theory and application. 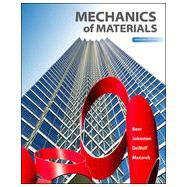 McGraw-Hill is proud to offer Connect with the seventh edition of Beer and Johnston's Mechanics of Materials. This innovative and powerful system helps your students learn more effectively and gives you the ability to assign homework problems simply and easily. Problems are graded automatically, and the results are recorded immediately. Track individual student performance - by question, assignment, or in relation to the class overall with detailed grade reports. ConnectPlus provides students with all the advantages of Connect, plus 24/7 access to an eBook Beer and Johnston's Mechanics of Materials, seventh edition, includes the power of McGraw-Hill's LearnSmart--a proven adaptive learning system that helps students learn faster, study more efficiently, and retain more knowledge through a series of adaptive questions. This innovative study tool pinpoints concepts the student does not understand and maps out a personalized plan for success.